Website redesigns and CMS migrations can be challenging from an SEO standpoint. And that’s especially the case on large and complex websites, where there are a lot of moving parts. In those cases, business owners and webmasters need to be methodical and meticulous to avoid negative impact. I’ve written a number of posts about migrations and redesigns over the years, based on helping many companies execute a website redesign, move to https, change domain names, or switch CMS platforms. You should definitely check out those posts if you are thinking about making big changes. I’ve provided a number of important points to consider before making the move. Based on working on many redesigns and migrations, as well as speaking with many webmasters that have faced challenges when changing urls, there seems to be one item that keeps getting left behind. It’s an item that simply gets no love during a redesign or migration (since it’s easy to miss). And it can definitely end up impacting a site negatively when changing urls. I’m referring to properly redirecting all images on the site when those urls will change. Although many people don’t think of it this way, images reside at urls too (just like articles, posts, pdfs, etc.) And those images could have built up links, and could be driving traffic via image search. But when companies work on gathering the necessary intelligence before a migration goes live, images often get left in the dust. In this post, I’ll cover more about this phenomenon, how to gather the necessary intel, how to redirect the urls, and then how to check that everything is ok once the redirects are in place. Redirecting images is a step you should definitely add to your migration checklist, and it very well could help you avoid negative impact during your redesign or migration. Before we hop into the core part of this post, some of you might be wondering, “do we really need to redirect images too?” The simple answer is yes, you should! Again, those images could have built up links, could be driving traffic, and could be helping with social sites like Pinterest. But hey, I get it. You want to hear a Googler explain it. No problem. John Mueller explained this during a webmaster hangout in August of this year. Here it is, at 57:29 in the video. Whenever urls change, you need to absolutely nail the redirection plan. 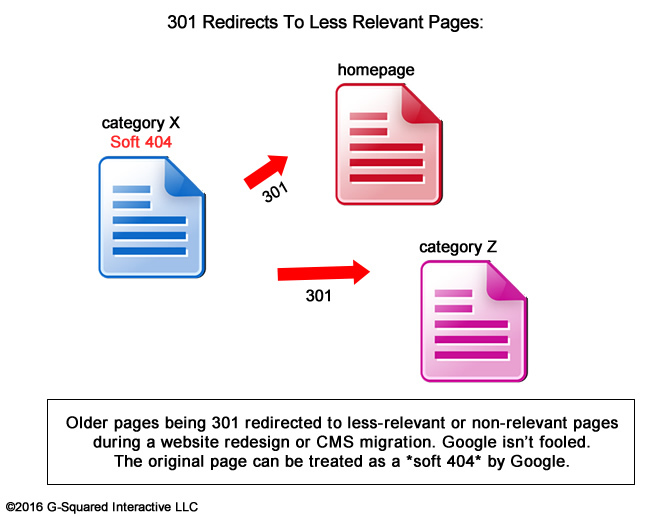 That means 301 redirecting all old urls to their new counterparts on a one-to-one basis (when possible). That doesn’t mean redirecting all old urls to the homepage of the site, or to less or non-relevant urls. If you do that, Google can see those pages as soft 404s (as I documented in a previous post of mine). And if that happens, then the pages will ultimately be treated as 404s, and Google will remove them from the index. Not good, to say the least. It’s also not optimal to skip the redirects altogether, which can result in 404s, dropped signals, and then forcing Google to find and re-index all of those images. And again, if the original image urls lose signals, then the new images have no guarantee of ranking where they did before (even if they get indexed at their new urls). And from an inbound link perspective, you’re going to lose those valuable links. Again, not good. You might also have some referral traffic leading to those images, which you will lose as well (as users hit a 404 page). As you can see, you definitely want to make sure all images redirect to the new urls that contain those images. And again, that should be a one-to-one mapping. i.e. Redirect each old url to its new url. The way you handle this completely depends on the situation at hand. For example, if there’s a pattern to the url changes, then you can use mod_rewrite or ISAPI_Rewrite using regular expressions (depending on if you’re running Linux or Windows). Then a few lines of code can handle all of the redirects in one fell swoop. If for some reason there’s not a pattern that you can leverage, then you might need to handle the redirects on a one-by-one basis. And if you have many image urls to redirect, speak with your developers about creating a custom solution for handling mass redirects. That might include creating a lookup table that can be referenced. Regardless, do not simply let your images 404. There’s no reason to let links and traffic drop when you change urls. Before a migration, I typically spend a lot of time gathering the necessary intelligence to make sure clients fully understand all of the urls that need to be redirected. That includes top landing pages from organic search, from referral traffic, urls that have built links, etc. From an images standpoint, there are a few ways to find that data. I’ll cover several of those items next. 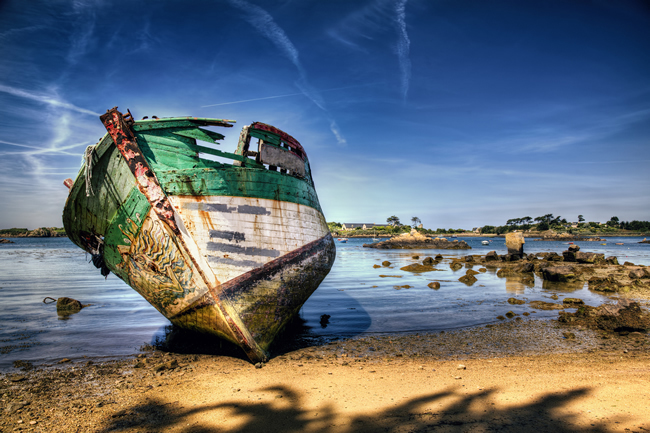 If you want to get a feel for where all of your images are residing, then crawl your site! I use both DeepCrawl and Screaming Frog extensively and both will surface image data. Once you crawl your site completely, click the Images tab in Screaming Frog to view all images that were picked up during the crawl. From a DeepCrawl standpoint, find the Resources report and then click “All Images”. Just like Screaming Frog, you will see a list of all images picked up during the crawl. 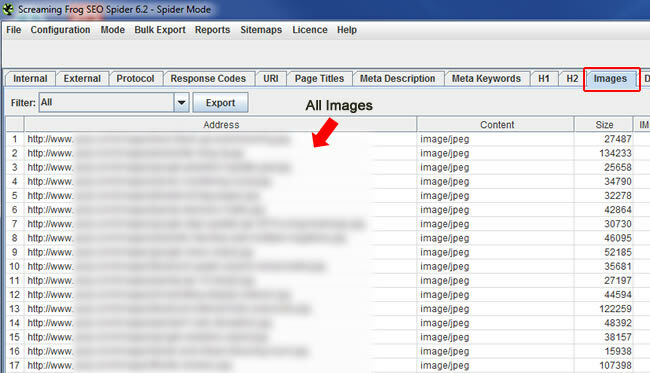 You can export the report and then make sure the images are handled properly during the redesign or migration. Using tools like Majestic or ahrefs, you can find images that have built links. So fire up your favorite link analysis tool (mine is Majestic) and export all of your links. Then you can filter in Excel for image files, like .jpg, .gif, or .png. Then make sure those image urls are properly redirected. Head to GSC and fire up the search analytics report. Click the Pages group to list all pages yielding impressions and clicks in Google. Then click the “Search Type” dropdown, select “Filter by search type”, and then select “Image” from the dropdown. This will show you all pages showing up in image search. Then export these urls to ensure they are redirected during the migration or redesign. But, those are just the urls of the webpages the images are included in. You still need to make sure all images are accounted for (the actual image urls). Tip: You could also click the “Queries” group at this point to see all of the keywords that lead to those pages in image search, which can help identify the images that are ranking well. Once you identify all the images contained on those pages, make sure those images are properly redirected. This can help you avoid losing traffic from image search. At this point, you will have a boatload of image intel from your site. 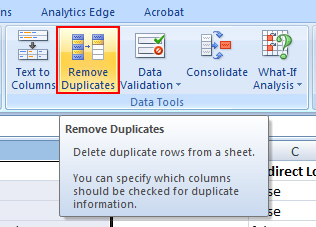 I recommend adding the list of urls to one worksheet in Excel and then deduping that list. Then you’ll have a final list of images and image urls to check. Before a redesign or migration goes live, it’s important to perform all the necessary checks on the site in staging before you pull the trigger. Don’t wait until the site is pushed to production to start auditing the url changes. Google will already be crawling and indexing those new urls, and if redirects are not in place, you’re setting yourself up for disaster. So, start by crawling those image urls in staging to ensure the proper redirects are set up! 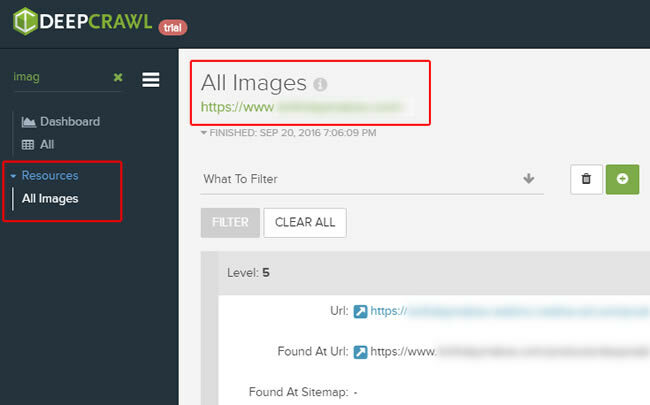 Take the deduped list and use a tool like DeepCrawl or Screaming Frog in list mode to crawl the old image files and the urls those images reside on, and make sure that the 301 redirection plan is perfect. And as I’ve said many times before, just because a url 301 redirects doesn’t mean the destination url resolves properly! For example, what if your 301 leads to a 404, 500, etc? That’s why it’s important to check redirect chains too. That will enable you to see if the redirects lead to 200s (which they should) or if they lead to non-200 header response codes. Again, there are times the redirect chain ends in a non-200 header response code, like a 404, 500, etc. That means your redirection plan is flawed and you can start leaking signals, rankings, and traffic. Not good. 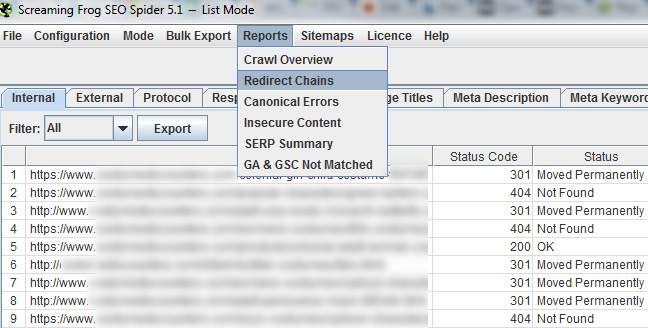 Both Screaming Frog and DeepCrawl have a redirect chains report. Use it! Make sure those redirects actually lead to 200s. If not, you can pay dearly. Beware. 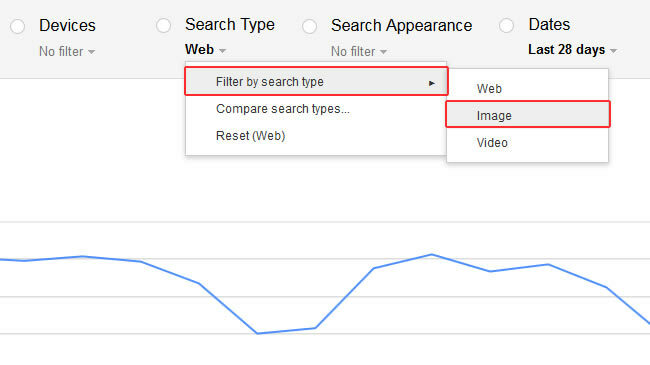 Once the redesign or migration goes live, then you should also monitor image search traffic via the Search Analytics report in GSC. Just like we checked before, you should use “Search Type” grouping, select “Filter by search type”, and then select “Image”. That will show you trending for clicks and impressions for images being surfaced in image search. If you see a drop when the redesign or migration went live, then go back through the process listed above to ensure all images are taken into account via the redirection plan. Summary – Images need redirects too. Again, redesigns and migrations have many moving parts. As I explained above, it’s critically important when changing urls to nail the redirection plan. And that includes images! So follow the steps I listed in this post and make sure you don’t leave your images in the dust. If you do, signals will be lost, you could lose valuable inbound links, and subsequent traffic. And that’s never a good thing. I’ve written in the past about how a robots.txt file could look fine, but actually not be fine. For example, maybe you add your directives, a sitemap file or sitemap index file, and then upload it to your site. You think all is good, but you find that directives are not being adhered to, maybe a boatload of urls that are being crawled that shouldn’t be, etc. When that happens, it can have a big impact on SEO (especially on large-scale sites with many urls that should never be crawled). So why does this sinister robots.txt problem happen? It often comes to down a single character. Literally. Sure, it’s an invisible character, but a character nonetheless. It’s called the UTF-8 BOM and I’m going to explain more about that in this post. Unfortunately, I’ve come across this issue many times during audits and while helping companies with technical SEO. It’s sinister, since it’s invisible. But the results are extremely visible (and can be alarming). 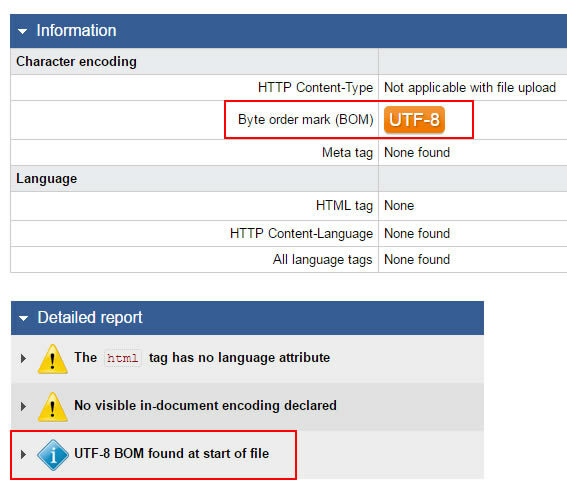 Below, I’ll cover what UTF-8 BOM is, how it can impact your robots.txt file, how to check for it, and then how to fix the problem. 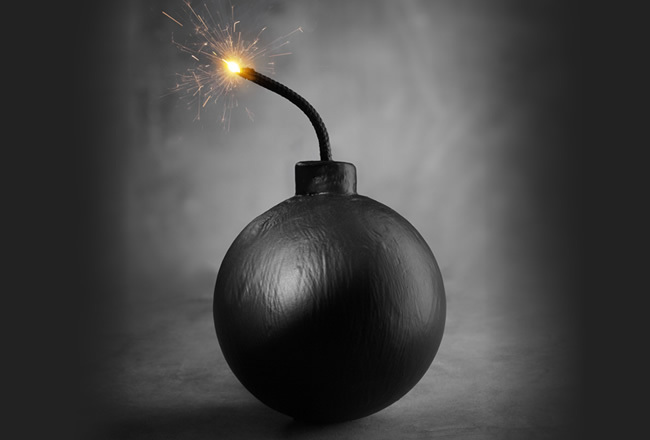 So, if your robots.txt file is bombing, and you are still scratching your head wondering what’s going on, then this post is for you. What can happen to a robots.txt file when UTF-8 BOM is present? As mentioned above, when your robots.txt file contains the UTF-8 BOM, Google can choke on the file. And that means the first line (often user-agent), will be ignored. And when there’s no user-agent, all the other lines will return as errors (all of your directives). And when they are seen as errors, Google will ignore them. And if you’re trying to disallow key areas of your site, then that could end up as a huge SEO problem. Needless to say, all of the directories that should be disallowed are not being disallowed. And that means many urls that shouldn’t be crawled are being crawled (and many are being indexed). This can lead to all sorts of nasty SEO problems. And that could include quality problems, as well, depending on what is being crawled and indexed. Right now, you might be sweating a little. Maybe you’ve seen problems with your robots.txt file and subsequent indexation, and you’re now wondering if UTF-8 BOM is the problem. 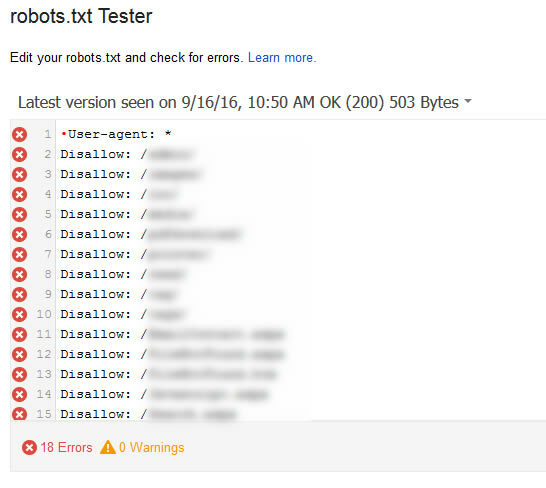 Don’t worry, I’ll quickly walk you through how to check your robots.txt file now. 1. First, fire up GSC and use the robots.txt Tester. When you view the report, does it look like the screenshot above? Is the first line showing a red X next to it? 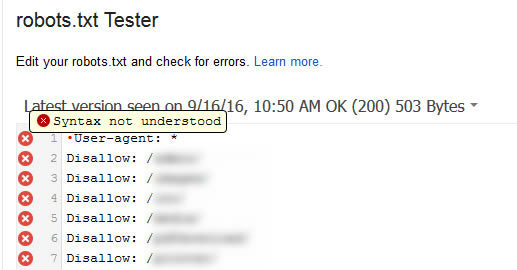 If so, hover over the x and you might see a hint that says, “Syntax not understood”. If so, there’s a good chance you’ve got the UTF-8 BOM situation I’ve been explaining. 2. Next, visit the W3C Internalization Checker. 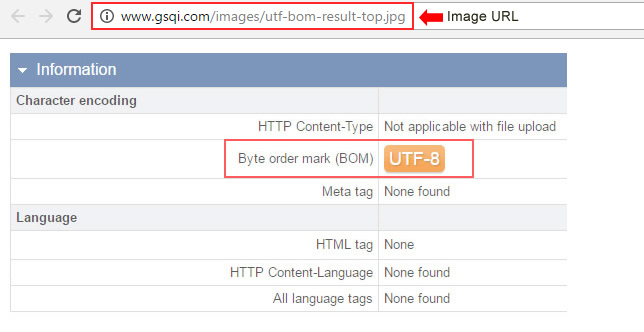 This tool will enable you to upload your robots.txt file and check for the presence of UTF-8 BOM. The tool will return the results, which will include a line about UTF-8 BOM. If you see that in the results, you know what the problem is (which is great). That’s the smoking gun. Fixing the issue is pretty easy. I recommend using a text editor like Textpad to create your new robots.txt file. When saving the file, ensure that BOM is not selected (some text editor programs have an option for adding the BOM). Also, make sure you’re not using a word processing application like Microsoft Word for creating your robots.txt file. I’ve seen that cause problems too. You should be using a pure text editor for creating your robots.txt file, .htaccess file, xml sitemaps, etc. I’m a big Textpad fan, but there are many others you can use as well. Once you make the changes, then use the W3C internationalization tool to check the revised file. If the BOM doesn’t show up, you’re good to go. If it is, you are doing something wrong while creating the robots.txt file. Go back and start over using a pure text editor. After you’ve fixed the problem, head back to GSC and to the robots.txt Tester. 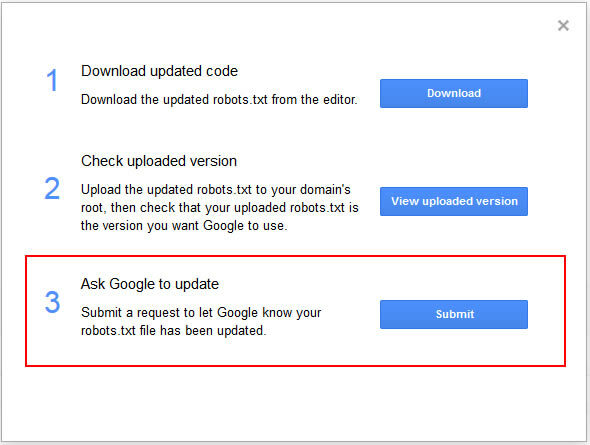 The tool enables you to submit a request to Google to retrieve your latest robots.txt file (after you upload the new one). If you’ve done everything correctly, the errors should be removed from the robots.txt Tester and your directives will now work (blocking directories and files that should not be crawled). If you’ve been experiencing robots.txt issues due to the UTF-8 BOM problem I’ve covered here, your work might not be done. If many pages have been indexed, then just blocking via robots.txt will not remove those pages from the index. Over time, Google can remove them, but I would try and get those undesirable urls out of Google’s index quickly. For example, you could add the meta robots tag using “noindex” and submit an xml sitemap to Google that contains all of the urls that you want deindexed. Then once you’re sure those urls are deindexed, you could block those directories again via robots.txt. But remember, if you add noindex to files that are being blocked via robots.txt, then Google will never be able to see the meta robots tag… You will need to let Google recrawl those pages first, see the meta robots tag using noindex, and then you can start blocking the files again. That’s a confusing subject for many in SEO, but it’s a really important one.